CMK Futures is based on an idea that education can change the world, and that teachers are the stewards of this change. They are competent professionals and should be treated with trust and respect. Our speaking, consulting, professional development, and publishing company honors the learner in all of us. Constructing Modern Knowledge – Now in its tenth year, CMK is a summer institute designed to unleash the creative educator who wants to understand how modern technology, combined with progressive pedagogy can work in real schools. Constructing Modern Knowledge 2017 registration is now open. Constructing Modern Knowledge Press – CMK Press is a publishing company for books that celebrate learning by doing, written by experts in their fields. Our flagship book, Invent To Learn: Making, Tinkering, and Engineering in the Classroom, started a classroom maker movement that has swept the globe. The lineup of books now includes leadership, technology, classroom practice, and young makers sharing their passion and expertise. View the CMK Press catalog. 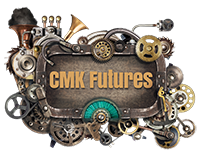 CMK Futures – Consequential professional development, speaking, hands-on events, consulting services, curriculum planning, learning space design, grant writing, and more.